Visual merchandising is essential for a successfully run retail store. Beautifully and well-displayed items will attract customers and encourage them to buy. If you are selling clothes or even accessories such as scarves, handbags and jewellery, it’s worth investing in shop mannequins to show customers how they can wear your merchandise and accessorise an outfit. Here’s a look at some the benefits of using retail mannequins to enhance your visual displays. Mannequins, also known as dummies are artificial dolls made in the human form. They give customers an idea of what clothes will look like on, whereas hangers and other types of displays don’t give a 3 dimensional perspective. By seeing clothes displayed on mannequins, many customers who already know their size, won’t even bother trying on clothes. They can instantly see how they will look and are happy to buy without spending time in the changing rooms. 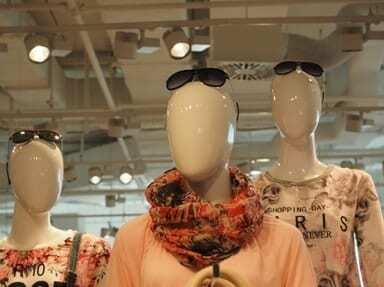 Mannequins can be used to highlight your newest and best-selling items. They are great for window displays and will grab attention more easily, encouraging customers to enter your shop. More importantly, a well co-ordinated mannequin can significantly help with up selling. A customer is looking for an outfit to wear for a wedding. Not only does she need a dress, but also shoes, jewellery and a clutch bag. She sees your mannequin adorned with a dress she likes. But she also sees the perfect accessories to complement her outfit. Not only does she buy the dress, but the accessories too. You’ve therefore made more than one sale. That’s up selling. If you have a bit of creative talent, then putting together a complete outfit is the perfect way to get more sales. The shape, size and gender of your mannequins are important. Choose larger dummies to effectively display plus size clothes. Make sure you dress your mannequins in the right sizes. Use pins to fit the clothes properly so they aren’t baggy or hanging off. Keep your mannequins spotlessly clean, especially when dressing them in white. Re-dress them regularly to create a fresh, new look that will keep customers interested. Mannequins come in all shapes and sizes: male, female, kids and babies. You can choose a full body or just the trunk. Sports retail stores can choose mannequins in a variety of sports poses. Valentino’s Displays offers a range of high-quality shop mannequins including sports mannequins. Contact us today or visit us online for more information.